While we love going camping as a family, we are not always good about reserving camp sites ahead of time. So, when we found ourselves wishing we had been more proactive this summer when we could not find any spots on a last minute whim, I decided to recreate the feeling I crave that comes from sitting at the camping table surrounded by nature. For the location of this styled table setting I couldn't think of a better place than All Heart Rentals showroom. Their tables and benches are made locally from sustainably harvested red wood in Northern California. 1. Nothing reminds me of camping more than enamel plates. The ones I used belong to the owners of All Heart Rentals, and were their wedding present, but are no longer available through West Elm. The couple is self-admittedly notorious for breaking dishes, hence a full set of metal ones for the every day use in their household. Utensil marks and chips in the enamel added to the worn feel of the table. 2. 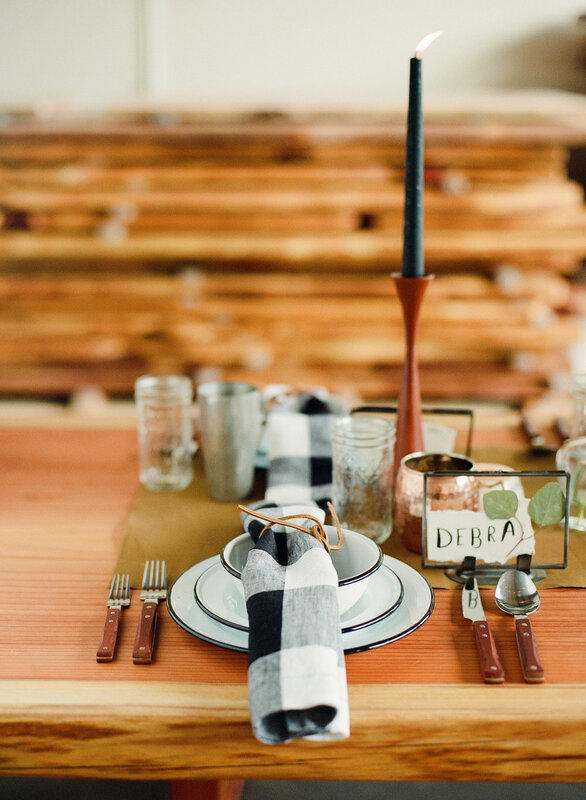 Plaid Linen Napkins add the cozy feel only a blanket with big checked pattern could lend. The napkins are our own, available in the shop here. Leather ties on the napkins contribute to the outdoorsy feel, and were sourced from Michaels Craft Store. The simple, utilitarian flatware with wooden handles is from IKEA. 3. Place Cards were hand-lettered with watercolor paint on torn scraps of watercolor paper and displayed in specimen picture frames with dried leaves and flowers (from an earlier flower press project). 1. The day before I collected all the wild berries, flowers, and sticks I could find in my neighborhood to create a foraged, unfussy look for the table decor. 2. I used a mix of vintage and new bottles and an aluminum milk jug to display the flower arrangements. Mixed metal (pewter and copper) drinking cups added warmth to the table settings. A coffee "station" with melamine and stainless steel cups, tall matches in the vintage copper match holder, a blanket, a travel bag and a pair of binoculars added to the cozy outdoor feel around the table and the sense of adventure.